The FIFA 19 team of the year has been announced by the EA Sports FIFA Twitter page, with plenty of Premier League stars in the mix. See the full XI in the picture below, with Manchester United goalkeeper David de Gea chosen along with Liverpool’s Virgil van Dijk in defence.
? 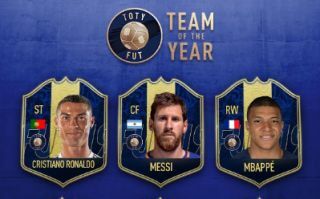 The #FIFA19 Team of the Year! ? Chelsea and Manchester City midfielders N’Golo Kante and Kevin De Bruyne both make it in, while the rest is fairly Real Madrid-dominated. Sergio Ramos, Marcelo and Raphael Varane make up three of the back four, while Luka Modric gets in in midfield, while Cristiano Ronaldo spent the first half of last year at the Bernabeu before moving to Juventus. Lionel Messi and Kylian Mbappe line up alongside Ronaldo up front in what is clearly a world class XI.